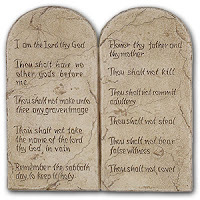 The Blog of Jared Kirk: Are You Using the 10 Commandments Wrong? Are You Using the 10 Commandments Wrong? When you think of the 10 Commandments what comes to mind? If you're like most people then you'd say either "a list of rules" or "a guide for life." Well, the 10 Commandments would definitely qualify as a list of rules, but if that contains the totality of your thinking then your missing out on the richness that they contain. The Reformers of the 16th Century developed 3 uses for the Law. We tend to think of the 10 Commandments in only one of the three ways, but when we expand our view, the power they contain becomes available to us. The 10 Commandments provide a barrier between us and sin. When the 10 Commandments are taught some people will be restrained from doing evil. In that way they are like a fence: they hem in the good and keep out the evil. There is definitely something to be said for being reminded to live right. It may be simplistic, but sometimes simplicity has inherent power. When we read the Decalogue (fancy word for the 10 Commandments) we see ourselves more clearly. We are stripped of much of the self-deceit we believe throughout the day to make our lives easier. In other words, when the 10 Commandments are taught, they reveal the sinner in his "nakedness and neediness" and cause us to reach out to God for the righteousness that we lack. Lastly the 10 Commandments mark out the way of life for the righteous. While the commandments are inherently negative, "thou shalt not..." it is valid to reason that the opposite of the negative is implied. In other words "Thou shalt not murder" is a prohibition against murder, but also a command to value the sanctity of each human life. Thus it can be said, "Love the Lord your God with all your heart, soul, and mind" and "Love your neighbor as yourself." This sums up all the law and the prophets.